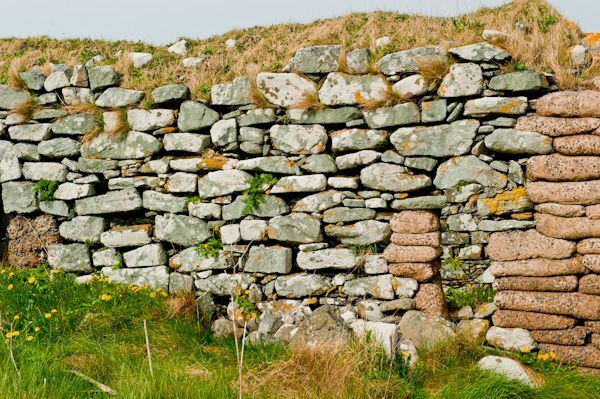 A fascinating site with a rich history, Cille Bharra stands near the northern end of the Eoligarry peninsula, north of Barra airport and its unique beach runway. 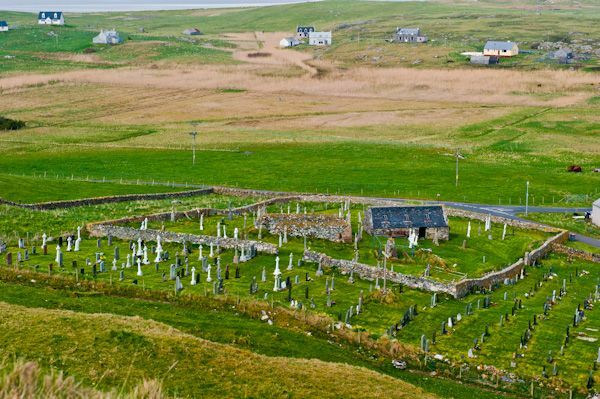 Within the stone walls enclosing the site stand three chapels, two now ruinous, dedicated to St Barr, the 7th-century Irish monk who gave his name to the island of Barra. The chapels probably date to the 12th century and later, but may occupy the site of much earlier buildings. The main chapel, now a roofless ruin, is made from lime-mortared walls split by several round-headed openings. Strangely, several of these arched doors and windows are altered to create pointed openings on the inner face of the wall. By the old main door lies a holy water stoup, and the altar base that once held a statue of St Barr is now overgrown at the east end. To the north stands a 15th-century chapel erected by the MacNeills. Barr, or Finnbarr, is traditionally said to have been from Cork, in Ireland, though another version of the story suggests that he was a native of Caithness. The main church is not the roofed building you see on entering the churchyard enclosure, but the roofless ruin directly ahead of you. This building is flanked by two chapels, the north and south chapels. 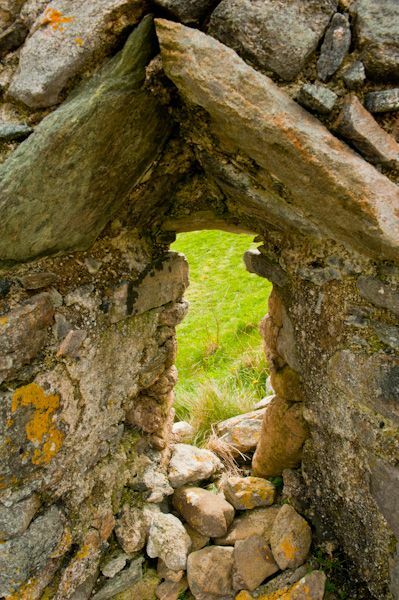 The south chapel is little more than a tumble of stones and a small section of upright walling. 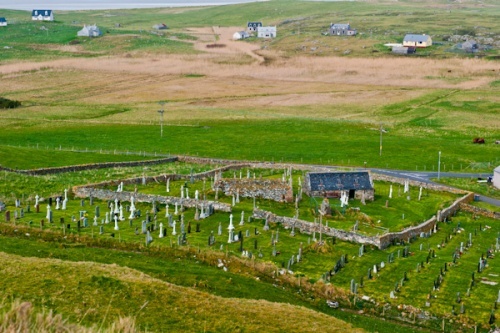 The north chapel, by contrast, has been restored and now houses several medieval grave slabs found in the graveyard, as well as a replica of the Kilbar Stone, or Clach Chille Bharra, a Christian-Nordic rune stone. Within the restored north chapel stands a replica of a wonderfully carved stone cross combining both Christian and Norse symbols. 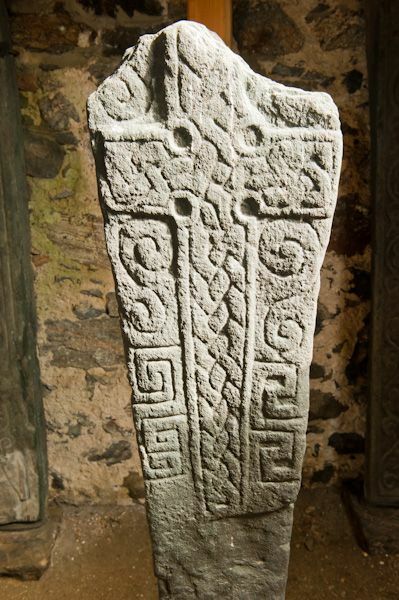 As one of the few examples of artefacts where both Nordic runes and Christian symbols are found together, the Kilbar Stone is of national importance. The original cross is housed in the Scottish Museum of Antiquities in Edinburgh, despite intermittent efforts to have it returned to its home on Barra. The replica, a precise cast of the original, is to your immediate right as you enter the north chapel. 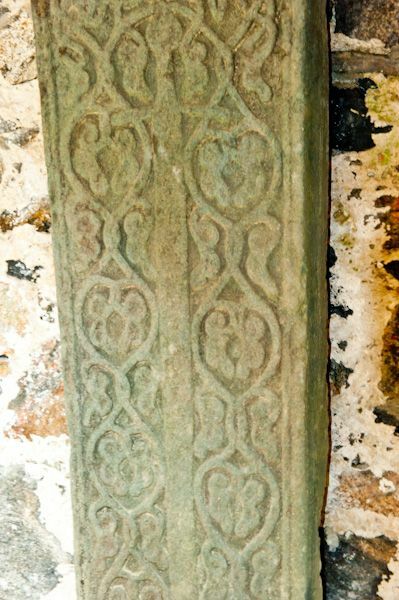 The front face of the stone as you see it is carved with a cross bordered by a scroll, with a plaited pattern for ornamentation. The reverse of the stone is inscribed vertically with runes which loosely translate as 'This cross has been raised in memory of Thorgeth, daughter of Steinar'. 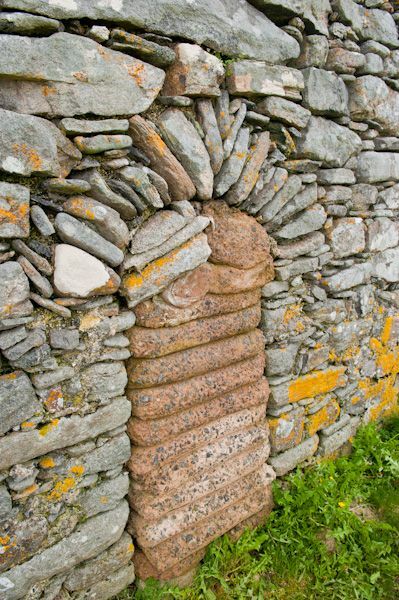 The stone dates to the late 10th or early 12th century and was discovered at Cille Bharra in 1865. 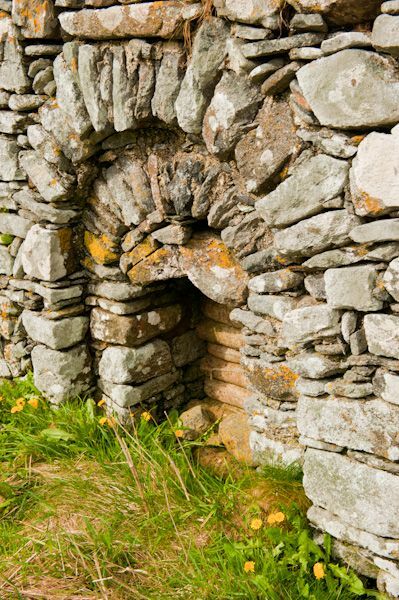 The presence of the stone suggests that Cille Bharra was in use as a Christian centre from a very early time, perhaps even as early as the 7th century, though there is little concrete evidence for this. 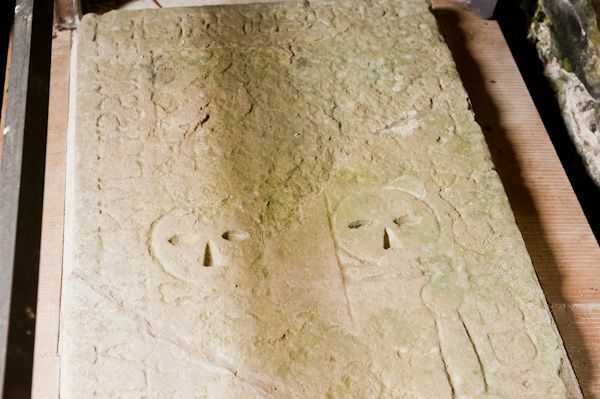 Also in the north chapel are four late medieval carved slabs, probably representing MacNeill chiefs. One of the slabs is carved with a galley, a common MacNeill symbol. One of the slabs is thought to have come from the workshop on Iona, while another is probably a product of the Oronsay school of carvers. One last point of interest at Cille Bharra is the grave of noted writer Sir Compton MacKenzie. 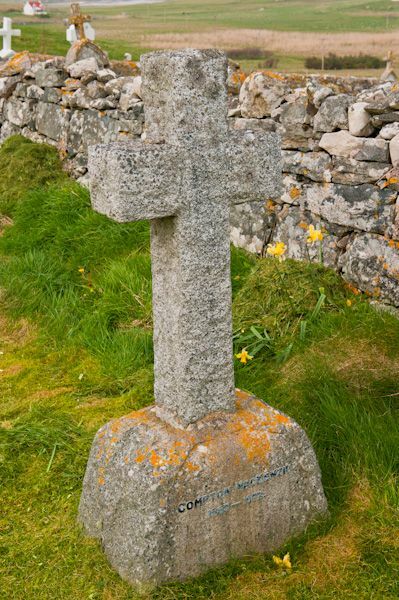 Mackenzie, the author of the humorous novel Whisky Galore, is buried beneath a simple stone cross in the upper graveyard, just north of the path. Cille Bharra stands with Rodel on the Isle of Harris as one of the most important centres of early Christianity in the Western Isles. There is some suggestion that there was an early priory here, though evidence for this is scanty. Location: Beyond Barra airport, in Eoligarry township at the north end of Barra. Large parking area beside the churchyard. Nearby accommodation is calculated 'as the crow flies' from Cille Bharra Church. 'Nearest' may involve a long drive up and down glens or, if you are near the coast, may include a ferry ride! Please check the property map to make sure the location is right for you.